Looking to rent a Vibratory Plow attachment for the Toro Dingo in Rochester NY, Ithaca NY and Western New York? The Vibratory Plow Attachment is a widely respected Tool Rental item. Precision engineering is featured by an important depth indicator, flexible head, heavy cast coulter, isolators and elliptical vibrating motion. 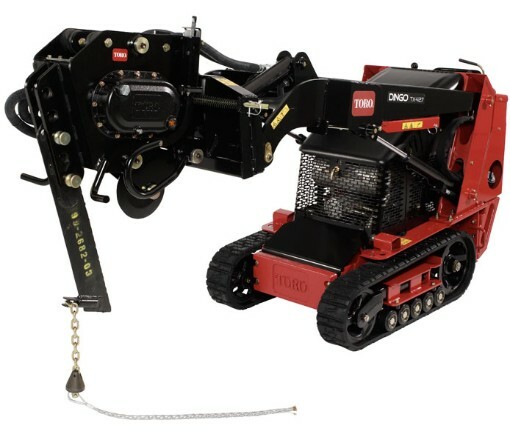 Powerful Toro Dingo & Vibratory Plow attachment capable of pulling pice of up to 2 inches in diameter. Blades available in 12 inches and 18 inches. Blade Adjustment = 0 to 18 inches. Working depth = 6 inches to 18 inches.